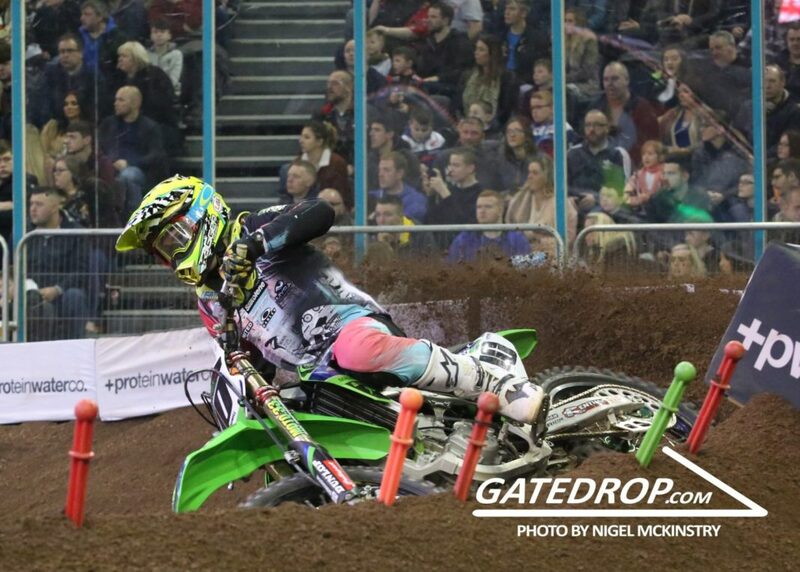 Jack Brunell had a great start to his Arenacross campaign in Belfast going 5-4 in the two superfinals over both nights. But Friday was a lot tougher for the Brit as he has two difficult 450 main events forcing him to win a tense head-to-head to make it into the Superfinal. But by Saturday he was on the pace all day and making it straight through the 450 mains into the Superfinal and coming away with a very strong fourth to underline his indoor skills in a stacked Arenacross field. We caught up briefly with the British indoor specialist to get his thoughts on the weekend. Tough night last night to begin with but you turned it around and tonightyou were really impressive with a fourth. Yeah yesterday, I felt alright on the track but didn’t really get a good time in for the 450 finals. I had a seventh and then in the second one got caught up in someone’s front wheel and went down and had to go to the head-to-head, won the that and got straight through to the Superfinal. I came out alright and finished fifth but woke up today feeling really good. The track was a lot more technical so it’s suits my ability a little bit better, qualified fourth which is the best I’ve qualified so I’m happy with that, I finished third in the first race which I was really happy with, I rode really strong , second race I finished fifth but I wasn’t really feeling the flow, I think I was riding too much. That gave me third 450 gate pick in the Superfinal but with the 250s going first that made it 8th. I didn’t get a great start to be honest but because I was on the outside I was able to tuck in the inside on the next turn before the finish and came out sixth. Made my way into fifth sand then fourth and jut rode a strong race really. I’m really happy with the results, I’ve been training hard for the last few months and stuff so I am really happy, A big thanks to Ross at team green Kawasaki and everyone that helps us. How do you find the format with the Superfinal? It looks tough to just make it in! Yeah you obviously don’t know how it’s going to go, especially in our class with so many strong riders, just make the Superfinal is an achievement but to get top five both nights, I’m over the moon with that.